forex, currency trading, forex trading, trading software, forex broker, foreign exchange trading, real time trading, real time currency exchange rate, forex trading system, forex news, spot forex, forex traders, online currency trading. To calculate R3/R2/R1/P/S1/S2/S3, enter previous period's high, low close and click 'Go'. - Hist_Step_MA_Stoch_KV1_Ex_03 set at 2000 bars. Set filters on Step: +0,04 and -0,04. - Plot aNina_v1, set it at 9000 cbars. signal simultaneously, the better. Do not trade if they give opposite signals. - TSR Daily Range Calculator or TSR range2. This calculator tells us the daily range of the pair. It is very important to know it. It is very important to know too where the pair is in relation to its daily range when we get a signal. It tells us the stop loss we should use according to the daily range and to a Risk/Reward ratio of 3:1. You can change the R/R. The stop loss it shows is a mathematical one, it is not based on any kind of pattern nor Technical Analysis. Do not forget that. FX Sniper’s MA. Set it to 50 and you will have EMA 50 with colors. Camarilladt7 with L3, L4, L5 and H3, H4 and H5. Buy when price crosses EMA 50 and new bar opens above. Hist_StepMA_Stoch must be green. Sell when price crosses EMA 50 and new bar opens below. Hist_StepMA_Stoch must be red. If price and Hist_StepMA_Stoch crosses are simultaneous, the better. For instance, when price is above EMA 50 with Hist_StepMA_Stoch in green. Price then opens one bar at least below EMA 50 and Hist_StepMA_Stoch keeps in green mode. When price opens again above EMA 50 with Hist_StepMA_Stoch validating (green), we can buy. The opposite for a sell. For instance, we are in bullish mode: price above EMA 50 and Hist_StepMA_Stoch in green. Suddenly, price goes down crossing or without crossing EMA 50 and obviously without opening below it. Hist_StepMA_Stoch changes to red. We buy when price goes up again always validated by Hist_StepMA_Stoch that should change to green again. Level 4 is when price, after a consolidation of a few bars, breaks through the last high or low. The main thing we need is an indication of strength, and if we don't get it, it could be a trap! Obviously, the breakout down should have Hist_StepMa_Stoch in red and green for the opposite. Notice the price breakout in the illustration? It would be hard to ignore, wouldn't it? Pairs to trade: EURUSD, USDCHF and GBPUSD. When bar opens more than 20 pips above/below EMA 50, the signal is riskier. Do not buy/sell, for instance, EURUSD because GBPUSD has a signal. Wait for the signal to come in each pair you want to trade. Look at EURGBP, USDCHF and US Dollar Index always. We can not jump in a trade without knowing the amount of pips we expect to make. We can not know that seriously without a stop loss. The stop loss will tell us what we should expect according to the Risk/Reward ratio we use. For instance, we get a validated signal to buy EURUSD at 1.2700. We decide to go with 1 standard lot. OK, where do we place the stop loss? A common and today useless stop loss is 34 pips. So, we are risking 34 pips, that is $340. If we do not want to gamble, we should expect to make $690 at least. That is 69 pips or 2:1 R/R. But the optimum R/R is 3:1. That is $1030 or 103 pips. EURUSD has usually a daily range between 60 and 80 pips. It is clear that we will not be able to make those 103 pips in the majority of cases. Then, what’s the point of using a fixed stop loss of 34 pips? We should not do that if we want to keep our money. So, we need to place a stop loss according to the risk and reward we assume and expect. Well, you could say, as I want a 3:1, I place the stop loss 5 pips below entry. That is, I’m risking 5 pips to make 15. Great!!! But this does not work that way, sorry. We use charts because we think they tell us what to do according to what price has done. If we use a s/l of 5 pips without looking at what price has done before we get the signal, we are not trading, but betting. What to do, then? We need to look at what price has done during the previous bars. They will tell us where to place the stop loss. If the “logic” stop loss we get is too high according to what we expect, we should not take that signal. So, lets say it is 17:30cet and we get a signal to buy EURUSD. The stop loss we need to use is 15 pips and EURUSD has only 10 pips to go up according to its daily range. Do we take it? But, you could say: “Daily ranges break sometimes”. Yes, they do. You said it: sometimes. We should not forget that if we scale during the trade, our risk/reward ratio changes, because we acceped a risk at the beginning of the trade according to a assumed reward we will not get; as the reward will not be the same at the end of the trade if we have taken partial profits during its development. CatFX50 easy system is a winning one, but it is not a Holy Grail nor a money machine. Use common sense. Do not forget that CatFX50 has not an exit strategy. Therefore, and it is mandatory, you need to know your risk/reward ratio before placing a trade. I make daily recaps of the signals CatFX50 gives. These recaps can be deceptive, because you see the huge amount of pips the system generates every single day. But no one can take them all. It is impossible. Do not forget that. Maybe, someday, a very smart trader will find the way to grab them all. Since then, take care and good luck!!! Within the first several minutes after opening, the market usually moves about or jumps somewhere abruptly. Experienced traders sometimes try to use their knowledge to forecast by the first market movements what trend is possible. But emotions will certainly play tricks with a newcomer. Well, you opened a long position. Then, after a couple of days, you saw how much money you had earned and closed the position with joy. But this movement, as you would have gathered later, was just the beginning of a powerful up-trend. So, if you would not haste, you could earn 10 times more money. Use TakeProfit orders only on extraordinary occasions, when the resistance level is clearly seen. Normally, it is better to exit the market using StopLoss and trailing stop. This is a reverse example: you opened a long position, but price decreased. You doggedly insist on that "it would still grow, I just opened the position too early" and add by buying more lots. But the price goes on dropping and twices your losses. Remember: You should only add lots to a profitable position. If you have some long positions and the price starts to decrease, you often instinctively try to fix your profit first and only then close losing positions (or let it work until the StopLoss triggers). This is a wrong tactics: If the whole market decreases, those positions will most probably lose that have already been unprofitable. But you have already had losses on them. This means you should close them first of all. Better positions will not fall so rapidly and, in case of a reversal, they will go up again. So do not haste to close a profitable position. A typical situation for a newcomer: A losing position has just been closed - and he or she starts opening new positions enthusiastically to requite the wrongs. This will result in new losses, so do not return to trading immediately after having lost. Rest a little. Approach reasonably to your positions: Do not care especially for some of them, for example, for those where you bought at the lowest price - every trader is usually especially proud of such trades. It is clear that you are puffed up with self-admiration, but be careful and do not carry such a brilliant position to zero or even to minus. You were working on a relatively short period of time, opened up, and prices went up tremendously. And you say to yourself: "Aha, I've caught the start of a many years' up-trend", and hang this position "for ever". But things do not just happen: you either change essentially for much longer estimation periods or keep standard rules on your standard short period. Rules that will make you enter and quit the market even if there is a really powerful trend. Do not "marry" your position! Vice versa, if you trade not within a day, do not close a profitable position on the first day under no conditions. If even the price has been grown to a very high level, be patient: it can be higher tomorrow. Many trade with systems of continuous entering the market. These systems are always "inside of a position". This means, closing of a long position means for them opening of a short one. One can use such positions, but they must be closed earlier: the signal to close must be of higher priority than the signal to open an opposite position. You should not trade if you are not sure of your previous situation assessment. Having said to yourself "I'm sick with vague doubts", you should better close all your positions and reanalyze the situation. Or go for a walk. The latter recommendation is actual in all difficult cases, by the way. It helps for all diseases - try it yourself! 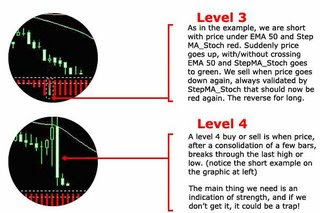 This simple exercise will increase Forex profits 100% and works for 99% of all short-term FX traders – stop trading so much – widen out your stops – widen out your profit targets – and only trade in the direction of the trend indicated by 4 hour chart. Sure there are no commissions but the spreads are HUGE and believe it or not (well you’ll believe it after you do the simple exercise below) the spreads are reducing your profits 100%! Initial stop loss should be a minimum of 23 points; I use between 23 and 35 point stop losses for short-term trading. Unless you think a trade can make you 100 points or more don’t do it. 1) Download all your trades for the year into an excel spreadsheet (if you don’t know how to do this ask your broker for help). 2) Determine the dollar value of the spread for each trade. 3) Sum up the total dollar value of all spreads for all trades and add this number it to your current account balance; this is your spread adjusted account balance. 4) Take your spread adjusted current account balance and divide it by your opening balance at beginning of year; the result will be a percentage change. 5) Take your actual current account balance and divide it by your opening balance at beginning of year; the result will be a percentage change. 6) Subtract your spread adjusted year to date percentage change from your actual year to date percentage change. In the FX market, you buy or sell currencies. Placing a trade in the foreign exchange market is simple: the mechanics of a trade are very similar to those found in other markets (like the stock market), so if you have any experience in trading, you should be able to pick it up pretty quickly. The object of Forex trading is to exchange one currency for another in the expectation that the price will change, so that the currency you bought will increase in value compared to the one you sold. An exchange rate is simply the ratio of one currency valued against another currency. For example, the USD/CHF exchange rate indicates how many U.S. dollars can purchase one Swiss franc, or how many Swiss francs you need to buy one U.S. dollar. The first listed currency to the left of the slash ("/") is known as the base currency (in this example, the British pound), while the second one on the right is called the counter or quote currency (in this example, the U.S. dollar).. When buying, the exchange rate tells you how much you have to pay in units of the quote currency to buy one unit of the base currency. In the example above, you have to pay 1.7500 U.S. dollar to buy 1 British pound. When selling, the exchange rate tells you how many units of the quote currency you get for selling one of the base currency. In the example above, you will receive 1.7500 U.S. dollars when you sell 1 British pound. You would buy the pair if you believe the base currency will appreciate (go up) relative to the quote currency. You would sell the pair if you think the base currency will depreciate (go down) relative to the quote currency. If you want to buy (which actually means buy the base currency and sell the quote currency), you want the base currency to rise in value and then you would sell it back at a higher price. In trader's talk, this is called "going long" or taking a "long position". Just remember: long = buy. If you want to sell (which actually means sell the base currency and buy the quote currency), you want the base currency to fall in value and then you would buy it back at a lower price. This is called "going short" or taking a "short position". Short = sell. All Forex quotes include a two-way price, the bid and ask. The bid is always lower than the ask price. The bid is the price in which the dealer is willing to buy the base currency in exchange for the quote currency. This means the bid is the price at which you (as the trader) will sell. The ask is the price at which the dealer will sell the base currency in exchange for the quote currency. This means the ask is the price at which you will buy. On this GBP/USD quote, the bid price is 1.7445 and the ask price is 1.7449. Look at how this broker makes it so easy for you to trade away your money. If you want to sell GBP, you click "Sell" and you will sell pounds at 1.7445. If you want to buy GBP, you click "Buy" and you will buy pounds at 1.7449. In this example euro is the base currency and thus the “basis” for the buy/sell. If you believe that the US economy will continue to weaken, which is bad for the US dollar, you would execute a BUY EUR/USD order. By doing so you have bought euros in the expectation that they will rise versus the US dollar. If you believe that the US economy is strong and the euro will weaken against the US dollar you would execute a SELL EUR/USD order. By doing so you have sold euros in the expectation that they will fall versus the US dollar. In this example the US dollar is the base currency and thus the “basis” for the buy/sell. If you think that the Japanese government is going to weaken the Yen in order to help its export industry, you would execute a BUY USD/JPY order. By doing so you have bought U.S dollars in the expectation that they will rise versus the Japanese yen. If you believe that Japanese investors are pulling money out of U.S. financial markets and coverting all their U.S. dollars back to Yen, and this will hurt the US dollar, you would execute a SELL USD/JPY order. By doing so you have sold U.S dollars in the expectation that they will depreciate against the Japanese yen. In this example the GBP is the base currency and thus the “basis” for the buy/sell. If you think the British economy will continue to do better than the United States in terms of economic growth, you would execute a BUY GBP/USD order. By doing so you have bought pounds in the expectation that they will rise versus the US dollar. If you believe the British's economy is slowing while the United State's economy remains strong like bull, you would execute a SELL GBP/USD order. By doing so you have sold pounds in the expectation that they will depreciate against the US dollar. In this example the USD is the base currency and thus the “basis” for the buy/sell. If you think the Swiss franc is overvalued, you would execute a BUY USD/CHF order. By doing so you have bought US dollars in the expectation that they will appreciate versus the Swiss Franc. If you believe that the US housing market bubble burst will hurt future economic growth, which will weaken the dollar, you would execute a SELL USD/CHF order. By doing so you have sold US dollars in the expectation that they will depreciate against the Swiss franc. I don't have enough money to buy $10,000 euros. Can I still trade? You can with margin trading! Margin trading is simply the term used for trading with borrowed capital. This is how you're able to open $10,000 or $100,000 positions with as little as $50 or $1,000. You can conduct relatively large transactions, very quickly and cheaply, with a small amount of initial capital. Margin trading in the foreign exchange market is quantified in “lots”. We will be discussing these in depth in our next lesson. For now, just think of the term "lot" as the minimum amount of currency you have to buy. When you go to the grocery store and want to buy an egg, you can't just buy a single egg, they come in dozens or "lots" of 12. In Forex, it would be just as foolish to buy or sell $1 EUR, so they usually come in "lots" of $10,000 or $100,000 depending on the type of account you have. * You believe that signals in the market are indicating that the British Pound will go up against the US Dollar. * You open 1 lot ($100,000) for buying the Pound with a 1% margin at the price of 1.5000 and wait for the exchange rate to climb. This means you now control $100,000 worth of British Pound with $1,000. Your predictions come true and you decide to sell. * You close the position at 1.5050. You earn 50 pips or about $500. (A pip is the smallest price movement available in a currency). So for an initial capital investment of $1,000, you have made 50% return. Return equals your $500 profit divided by your $1,000 you risked to trade. No, this is not the same as rollover minutes from your cell phone carrier! For positions open at your broker's "cut-off time" usually 5pm EST, there is a daily rollover interest rate that a trader either pays or earns, depending on your established margin and position in the market. If you do not want to earn or pay interest on your positions, simply make sure they are all closed before 5pm EST, the established end of the market day. Since every currency trade involves borrowing one currency to buy another, interest rollover charges are part of forex trading. Interest is paid on the currency that is borrowed, and earned on the one that is bought. If a client is buying a currency with a higher interest rate than the one he/she is borrowing, the net differential will be positive (i.e. USD/JPY) – and the client will earn funds as a result. Ask your broker or dealer about specific details regarding rollover. Are you still confused and in need of an example? No problem - we discuss rollover more in depth in our School of Pipsology, so you'll be able to go there to learn more. You can open a demo account for free with most Forex brokers. This account has the full capabilities of a "real" account. Why is it free? It’s because the broker wants you to learn the ins and outs of their trading platform, and have a good time trading without risk, so you’ll fall in love with them and deposit real money. The demo account allows you to learn about the Forex markets and test your trading skills with ZERO risk. YOU SHOULD DEMO TRADE FOR AT LEAST 2 MONTHS BEFORE YOU EVEN THINK ABOUT PUTTING REAL MONEY ON THE LINE. I REPEAT, YOU SHOULD DEMO TRADE FOR AT LEAST 2 MONTHS BEFORE YOU EVEN THINK ABOUT PUTTING REAL MONEY ON THE LINE. "I will demo trade for at least 2 months before I trade with real money." "I am a smart and patient Forex trader!" If you want a successful FOREX trading strategy, you should incorporate the following tips into your existing strategy – you should then become a profitable currency trader. The aim is not to just to make money, but to make big profits consistently. You need to have total confidence in your method - so you can follow it with discipline. Pick a simple, technical method - simple methods work best, as they’re more robust in the face of brutal market conditions - complicated methods tend to break. Just use a few rules and parameters, and they should work across all markets – a technical trading system should work on ANY market that trends. 2. You need to have the Mindset to Take Risks! You will read a lot about money management - but keep in mind risk = reward. If you don’t take reasonable risks, you won’t make big profits. 2% is a commonly touted figure to risk per trade - but if you’re trading $10,000 that’s just $200. Risk more if you’re confident - 10% is fine - you just need to be selective with your trades. You can have the best FOREX trading strategy, but you need to take calculated risks to make big gains. The good trades only come around a few times a year, so focus on them. Many traders think there are good opportunities everyday - there aren’t. There’s no correlation between how often you trade, and how much money you will make - if you want to make big profits, you need patience. Forget day trading, and focus on the longer-term trends only - how can you make big profits in a day? - You can’t. Don’t forget you have to cover your losing days as well. Always remember - brokers interested in making the maximum amount of commission, perpetrate the make money by day trading myth. Currency trends last for months or years - focus on them, and milk them for all they’re worth. Don’t discuss your trading with anyone - the only way you’ll make big money is by doing it by yourself. Have confidence in your ability and don’t let anyone put you off - this is an essential character trait of all great traders. Many losing traders think the more effort they make with their FOREX trading strategy, the greater their trading skills will become – this is not true! You can learn a method in a short period of time, and if you have a simple robust method, you can do your analysis in about 30 minutes a day - and that’s it! So there you have it - a FOREX strategy designed to make you big profits. Many of the above tips are not conventional wisdom - but keep in mind that 90% of traders don’t make big gains – and they follow the herd. Step away from the crowd, and incorporate the above tips into your existing FOREX trading strategy – you could become very rich! Currency exchange is necessary in numerous circumstances. Consumers typically come into contact with currency exchange when they travel. They go to a bank or currency exchange bureau to convert one currency (typically, their "home currency") into another (i.e., the currency of the country they intend to travel to) so they can pay for goods and services in the foreign country. Consumers may also purchase goods in a foreign country or via the Internet with their credit card, in which case they will find that the amount they paid in the foreign currency will have been converted to their home currency on their credit card statement. Although each such currency exchange is a relatively small transaction, the aggregate of all such transactions is significant. Businesses typically have to convert currencies when they conduct business outside their home country. For example, if they export goods to another country and receive payment in the currency of that foreign country, then the payment must often be converted back to the home currency. Similarly, if they have to import goods or services, then businesses will often have to pay in a foreign currency, requiring them to first convert their home currency into the foreign currency. Large companies convert huge amounts of currency each year; for example, a company such as General Electric (GE) converts tens of billions of dollars each year. The timing of when they convert can have a large affect on their balance sheet and "bottom line. Investors and speculators require currency exchange whenever they trade in any foreign investment, be that equities, bonds, bank deposits, or real estate. For example, when a Swedish investor buys shares in Sun Microsystems on the NASDAQ, she will have to pay for the shares in U.S. Dollars and likely have to convert Swedish Krona to U.S. Dollars. Similarly, a Japanese real estate investor who sells a New York property may well want to convert the proceeds of the sale in U.S. Dollars to Japanese Yen. Investors and speculators also trade currencies directly in order to benefit from movements in the currency exchange markets. For example, if an American investor believes that the Japanese economy is strengthening and as a result expects the Japanese Yen to appreciate in value (i.e., go up relative to other currencies), then she may want to buy Japanese Yen and take what is referred to as a long position. Similarly, if an American investor believes that the Euro will go down over time, then she may want to sell Euro to take a short position. Interestingly, investors and speculators can profit equally from currencies becoming stronger (by taking a long position) or from currencies becoming weaker (by taking a short position). Speculators are often day traders, trying to take advantage of market movements in very short time periods; buying a currency and then selling it again may happen within hours or even minutes. They are attracted to currency trading for numerous reasons, including (i) the size and daily volatility of the market, which gives them unparalleled excitement, (ii) the almost perfect liquidity of the currency exchange market, (iii) the fact that the currency exchange market is "open" 24 hours a day market, and (vi) the fact that currencies can be traded with no brokerage charges. Commercial and Investment Banks trade currencies as a service for their commercial banking, deposit and lending customers. These institutions also generally participate in the currency market for hedging and proprietary trading purposes. Governments and central banks trade currencies to improve trading conditions or to intervene in an attempt to adjust economic or financial imbalances. Although they do not trade for speculative reasons --- they are a non-profit organization --- they often tend to be profitable, since they generally trade on a long-term basis. Currency exchange rates are determined by the currency exchange market. (The currency exchange market is described further below.) A currency exchange rate is always quoted for a currency pair using ISO code abbreviations. For example, EUR/USD refers to the two currencies Euro (the European currency) and U.S. Dollar. The first is referred to as the base currency, while the second as the quote currency. The EUR/USD exchange rate specifies how many US Dollars you have to pay to buy one Euro, or conversely how many US Dollars you obtain when you sell one Euro. More generally, if buying, an exchange rate specifies how much you have to pay in the quote currency to obtain one unit of the base currency, and if selling, the exchange rate specifies how much you get in the quote currency when selling one unit of the base currency. A currency exchange rate is typically given as a pair consisting of a bid price and an ask price. The ask price applies when buying a currency pair and represents what has to be paid in the quote currency to obtain one unit of the base currency. The bid price applies when selling and represents what will be obtained in the quote currency when selling one unit of the base currency. The bid price is always lower than the ask price. The difference between the bid and the ask price is referred to as the spread. When trading large amounts of $1M or higher, the spread obtained in a quote is typically 5 basis points or PIPs, with each basis point referring to 0.0001 (or 0.01 when, say, the Yen is involved). In the example above, the spread is 0.0005 or 5 PIPs. When trading smaller amounts, the spread may be larger; for example, when trading less than $100,000, spreads of 50-200 PIPs are common. Credit card companies typically apply a spread of 200-300 PIPs. Banks and exchange bureaus typically use a spread in the range of 200-1000 PIPs (in addition to charging a commission). For investors and speculators, a lower spread translates into easier profit taking due to movements in exchange rates. The currency exchange market is an inter-bank or inter-dealer market that was established in 1971 when floating exchange rates began to materialize. In addition, it is an Over-The-Counter market, meaning that transactions are conducted between any two counter parties that agree to trade via the telephone or electronic network. Trading is thus not centralized, as is the case with many stock markets (i.e., NYSE, ASE, CME) or as the case for currency futures and currency options, which trade on special exchanges. Dealers often "advertise" exchange rates using a distribution network, such as the one provided by Reuters or Bridge. Dealers then use the information obtained there (or directly) to "agree" to a rate and a trade. The major dealing centers today are: London, with about 30% of the market, New York, with 20%, Tokyo, with 12%, Zurich, Frankfurt, Hong Kong and Singapore, with about 7% each, followed by Paris and Sydney with 3% each. In terms of trading volume, the currency exchange market is the worlds largest market, with daily trading volumes in excess of $1.5 trillion US dollars. This is orders of magnitude larger than the bond or stock market. For example, the New York Stock Exchange has a daily trading volume of approximately $60 billion. Thus, the currency exchange market is by far the most liquid market in the world today. Because of the volume in trading, it is impossible for individuals or companies to affect the exchange rates. In fact, even central banks and governments find it increasingly difficult to affect the exchange rates of the most liquid currencies, such as the US dollar, Japanese Yen, Euro, Swiss Frank, Canadian Dollar or Australian Dollar. The currency exchange market is a true 24-hour market, 5 days a week. There are dealers in every major time zone. Trading begins Monday morning in Sydney (which corresponds to 3pm EST, Sunday) and then daily moves around the globe through the various trading centers until closing Friday evening at 4:30pm EST in New York. Today, over 85% of all currency exchange transactions involve a few major currencies: the US Dollar (USD), Japanese Yen (JPY), Euro (EUR), Swiss Frank (CHF), British Pound (GBP), Canadian Dollar (CAD), and Australian Dollar (AUD). In the currency exchange market, most of the currencies are traded only against the US Dollar. The term cross rate refers to an exchange rate between two non-dollar currencies. Trading between two non-dollar currencies usually occurs by first trading one against the US Dollar and then trading the US Dollar against the second non-dollar currency. Because of this, the spread in the exchange rate between two non-dollar currencies is often higher. (There are a few non-dollar currencies that are traded directly, such as GBP/EUR or EUR/CHF.) The following directly traded currency pairs make up the vast majority of the trading volume and are thus considered to be the most important ones: EUR/USD, USD/JPY, EUR/JPY, USD/CAD, EUR/GBP, GBP/USD, USD/CHF, AUD/USD, and AUD/JPY. Currency trading is always done with currency pairs, such as EUR/USD, and so it is useful to consider the currency pair as an instrument, which can be bought or sold. equivalently that the corresponding exchange rate will go up. equivalently, that the quote currency will go up relative to the base currency. After buying a currency pair, the trader will have an open position in the currency pair. Right after such a transaction, the value of the position will be close to zero, because the value of the base currency is more or less equal to the value of the equivalent amount of the quote currency. In fact, the value will be slightly negative, because of the spread involved. The transaction occurs if the final response is either a buy or a sell. The dealer is required to quote a "good" market price, since he does not know whether the trader will buy or sell. The currency exchange market described above is referred to as the spot market and the transaction described is referred to as a spot deal. A spot deal consists of a bilateral contract between a party delivering a specified amount of a given currency against receiving a specified amount of another currency from a second counter party, based on an agreed exchange rate, within two business days of the deal date, which is referred to as the settlement date. (The settlement date for USD/CAD is one business day after the deal date.) Speculators rarely deliver, however. Instead, they use what is referred to as a rollover swap. The rollover swap is designed to allow the changing of an old deal date to the current date by simultaneously closing an open position for todays date and opening the same position for the next day at a price reflecting the interest rate differential between the two currencies. When a trader buys or sells a currency pair, the value of the currency pair, as an instrument, initially is close to zero. This is because (in the case of a buy) the quote currency is sold to buy an equivalent amount of the base currency. As the market rates fluctuate, however, the value of the currency pair position held will also fluctuate. Thus, if the rate for the currency pair goes down, the speculators long position will lose in value and become negative. To ensure that the speculator can carry the risk for the case where the position results in a loss, banks or dealers typically require sufficient collateral to cover those losses. This collateral is typically referred to as margin. To limit down-side risk, traders often specify a Stop-Loss rate for each open trade. The Stop-Loss specifies that the trade should be closed automatically when the currency exchange rate for the currency pair in question reaches a certain threshold. For long positions, the Stop-Loss rate is always lower than the current exchange rate; for short positions, it is always higher. Traders, at times, also specify a Take-Profit rate for their trades in order to lock in a profit when the exchange rate reaches a certain threshold. For long positions, the Take-Profit rate must be above the current rate, while for short positions, it must be below the current rate. currency pair of the position when the exchange rate reaches a specified level. The Foreign Exchange market, also referred to as the "Forex" or "FX" market, is the largest financial market in the world, with a daily average turnover of well over US$1 trillion -- 30 times larger than the combined volume of all U.S. equity markets. "Foreign Exchange" is the simultaneous buying of one currency and selling of another. There are two reasons to buy and sell currencies. About 5% of daily turnover is from companies and governments that buy or sell products and services in a foreign country or must convert profits made in foreign currencies into their domestic currency. The other 95% is trading for profit, or speculation. For speculators, the best trading opportunities are with the most commonly traded (and therefore most liquid) currencies, called "the Majors." Today, more than 85% of all daily transactions involve trading of the Majors, which include the US Dollar, Japanese Yen, Euro, British Pound, Swiss Franc, Canadian Dollar and Australian Dollar. A true 24-hour market, Forex trading begins each day in Sydney, and moves around the globe as the business day begins in each financial center, first to Tokyo, London, and New York. Unlike any other financial market, investors can respond to currency fluctuations caused by economic, social and political events at the time they occur - day or night. The FX market is considered an Over The Counter (OTC) or 'interbank' market, due to the fact that transactions are conducted between two counterparts over the telephone or via an electronic network. Forex Trading is not centralized on an exchange, as with the stock and futures markets. The foreign exchange market is not a "market" in the traditional sense. There is no centralized location for trading as there is in futures or stocks. Trading occurs over the telephone and on computer terminals at thousands of locations worldwide. Foreign Exchange is also the world's largest and deepest market. Daily market turnover has skyrocketed from approximately 5 billion USD in 1977 to a staggering 1.5 trillion US dollars today; even more on an active day. Most foreign exchange activity consists of the spot business between the US dollar and the six major currencies (Japanese Yen, Euro, British Pound, Swiss Franc, Canadian Dollar and Australian Dollar) The FOREX market is so large and is controlled by so many participants that no one player, governments included, can directly control the direction of the market, which is why the FOREX market is the most exciting market in the world. Central banks, private banks, international corporations, money managers and speculators all deal in FOREX trading.